Nicole Coolidge Rousmaniere is the founding Director of the Sainsbury Institute and Professor of Japanese Art and Culture at the University of East Anglia. Since Summer 2011 she is Research Director of the Sainsbury Institute and seconded to the British Museum as IFAC Handa Curator of Japanese Art in the Department of Asia. Professor Rousmaniere is lead curator on the Manga exhibition held 23 May to 26 August 2019 in the Sainsbury Exhibition Galleries of the British Museum, the largest exhibition of manga to be held outside of Japan. In 2010 she facilitated and translated the British Museum’s first manga, Hoshino Yukinobu’s Professor Munakata’s British Museum Adventure. Ceramics are a significant research area for Nicole: in 2007 she curated the Crafting Beauty Exhibition at the British Museum; in 2012 she wrote Vessels of Influence: China and the Birth of Porcelain in Medieval and Early Modern Japan (Bloomsbury Academic); and in 2016 she was curator for the British Museum exhibition Made in Japan: Kakiemon and 400 years of porcelain. She spent three years on secondment as a Visiting Professor in Cultural Resource Studies at Tokyo University (2006-2009). 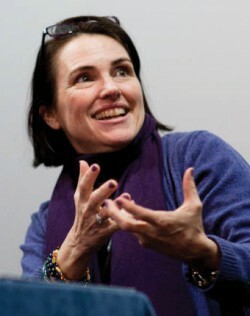 She received her PhD from Harvard University in 1998. Nicole Coolidge Rousmaniere’s current research includes completing a manuscript for the British Museum Press entitled Four Hundred Years of Japanese Porcelain based on the British Museum holdings. Her recent translation of Tsuji Nobuo’s History of Art in Japan was released by Tokyo University Press and won the Japanese Translator’s award prize for 2018. Her research interests include early modern to contemporary ceramics in East Asia and particularly Japan, East Asian trade networks, the history of archaeology and collecting things Japanese.